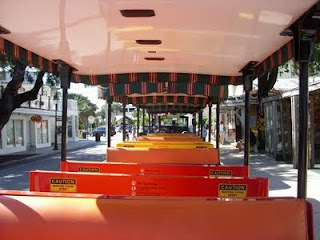 If you do go to Key West and wander through the touristy areas like Old Town or go to see the Southernmost Monument, you're going to see these trams. They are everywhere going through the streets with a driver in the front giving you some explanation on what you're seeing and where you are. I guess its fun to do first time you're anywhere, there are tours like this in many cities. As you can tell, I like to walk and take pics instead of having this particular view but this does have its own charm.